Copyright: Igor K. This is an open access article distributed under the Creative Commons Attribution License, which permits unrestricted use, distribution, and reproduction in any medium, provided the original work is properly cited. The article presents the results of x-ray anatomical studies of 56 whole lung preparations, which were carried out immediately after the autopsy of children who died from АP. In 47 cases it was carried out the contrast of the vessels and in 9 cases the bronchial tree. The results allowed to clarify some details of the pathogenesis of АP and were additional arguments in support of the new doctrine of the disease. Acute pneumonia (AP), described by Hippocrates two and a half millennia ago , is one of the oldest nosologies in medicine. However, a long history of popularity and study of AP does not prevent it from being an important and urgent problem so far. “Pneumonia is a common illness affecting approximately 450 million people a year and occurring in all parts of the world” .”It is a major cause of death among all age groups resulting in 4 million deaths (7% of the world’s total death) yearly” . АP, which throughout its history belonged to the category of non-specific inflammatory diseases, in recent years is increasingly referred to as an infectious process. In this situation, we are talking not only and not so much about the nuances of terminology, but about the difference of views and ideas about the nature of the disease. It is our understanding of the nature of the disease that determines the principles of treatment choice. Currently, the leading principle of treating AP as an infectious disease is an “antibiotics alone”, but the results of such approaches to treatment are of increasing concern to specialists. On the one hand, the reason for the lack of effectiveness of traditional treatment trends is the mismatch between the pharmaceutical role of antibiotics and the type of pathogen, because almost half of patients with AP in the world have a viral nature of the process . On the other hand, ”inflammation is not synonymous with infection”, but “the mechanism of inflammation is common to all organisms, regardless of localization, type of stimulus and individual characteristics of the organism” . In addition, АP is the only non-specific inflammatory process of all known nosologies, which develops in the vascular system of the small circle of blood circulation. One of the leading cases of tissue transformation in the area of inflammation is a vascular reaction, which has a stereotypical sequence, while the vessels of the small circle of blood circulation are an integral part of the regulation of systemic blood flow. The combination of these reasons reflects the importance of a comprehensive study of the vascular bed of the lungs to understand the mechanisms of development and manifestation of АP. Studies were conducted in the Clinic of pediatric surgery at The State Institute for Advanced Training of Doctors (Novokuznetsk, USSR) in 1976-1985.During this period, the Department treated 994 children aged 4 months to 14 years with various forms of so-called community-acquired pneumonia and its purulent-destructive complications. Many patients from this number were selectively hospitalized in our Department in the initial period of the most aggressive forms of AP immediately at diagnosis. The reason for hospitalization of the last group of patients is that the surgical clinic was the only place of intensive care in our region with a population of about 2 million people. This group of patients was characterized by high mortality (more than 10 %) and rapid development of pleural complications. Unsatisfactory results of traditional treatment (massive doses of antibiotics, oxygen supply, methods of bronchial drainage, intravenous infusion) and a large concentration of very severe patients are forced to look for effective solutions. The work began with a review of theoretical ideas about the nature of АP, its causes and mechanisms of development. For this purpose, known scientific data from certain biomedical rules and laws were used. To clarify some of the nuances of the disease and obtain objective evidence of the measures taken, special studies and experiments were conducted. One of the fragments of this work is presented below. 56 whole lung anatomical preparations were taken for this study during the autopsy of children who died of pneumonia. 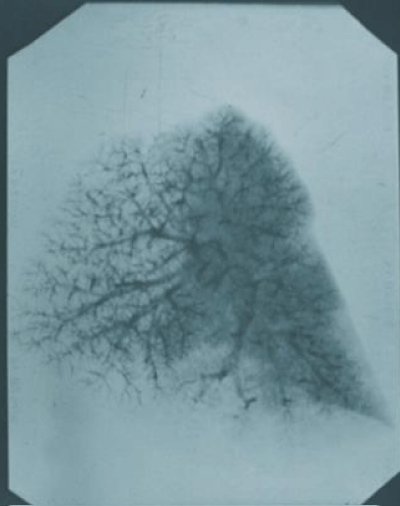 Separate contrast vessels of the lungs (arteries or veins) followed by x-ray examination were performed on 47 samples (in 9 cases bronchi were contrasted). This type of research was carried out as follows. The procedure was carried out immediately after the autopsy and extraction of the specimen, which was not subjected to any additional effects. The polychlorinated vinyl catheter was inserted into the initial part of the corresponding vessel and strictly fixed in this position by an external silk ligature. The fixed catheter had a cannula at the distal end, to which a syringe with a liquid contrast agent was attached. Used contrast agents, which are usually used in the clinic for diagnostic purposes by intravenous. The contrast was injected a slight pressure on the plunger of the syringe until the first signs of resistance. X-ray specimen was performed immediately after contrast injection. Pathological transformation in lung tissue ranged from inflammatory infiltration to necrosis and suppuration, and the extent of these changes was necessarily assessed by standard macro-and microscopic studies. Since these studies, there have been no radical changes in the solution of the АP-problem, and no such tests have been conducted. Therefore, the results of research may be of interest to specialists in this field. The inflammatory process, regardless of localization, is accompanied by five classical signs reflecting the severity of tissue damage. These signs of inflammation, which were described by Celsus and Galen centuries ago, are well known because they remain at the heart of our understanding of this pathology . AP is a classic inflammatory process and has all of the above symptoms-heat, pain, redness, swelling and loss of function. It is easy to note that among the presented signs of inflammation the fifth sign (loss of function) is of the greatest importance, since the specificity and severity of its clinical manifestations just depend on the localization of the process. In this regard ,it should also be noted the well-known fact that AP, as a rule, occurs without the appearance of the second classical sign of inflammation(pain), due to the lack of pain receptors in the lung tissue itself. The appearance of pain syndrome in AP usually indicates the participation of pleural sheets in the inflammatory process. However, other types of receptors, in particular baroreceptors, which are in the area of inflammation, cannot avoid the irritating effects of inflammatory tissue transformation, and this fact can significantly affect the regulation of blood circulation in the body. Well-known scientific facts about inflammation allow us to recall that the inflammatory transformation of tissues occurs due to the vascular reaction, which is based on successive stages of changes in blood flow, blood filling, and permeability of the vascular wall. In the case of AP, especially its aggressive forms with lobar organ damage, the anatomical picture of these stages has long been described and is well known . These anatomical stages are described in detail in the lobar forms of АP without destructive changes: congestion, red hepatization, grey hepatization, resolution . These stages of inflammatory changes in lobar pneumonia have long been included in the category of classical descriptions of the disease, but this description, unfortunately, does not give a sufficient idea of a very significant detail of the restructuring of the vascular bed. According to the well-known biological postulate, the anatomical shape and structure of the organ correspond to its function (and Vice versa).Edema and inflammatory infiltration of tissues arising from АP, eliminate the airiness of the alveoli in the affected area and disconnect it from gas exchange. The fact of such anatomical transformation also refers to the classical characteristics of the АP. However, the transformation of the architectonics of blood vessels in the area of inflammation, which play an important role in the regulation of blood flow, requires clarification. Our rentgenoanatomical studies have yielded the following results. Contrast studies of the vessels of the small circle of blood circulation showed that the arterial sector in the early stages (infiltration) of the inflammatory process retains its shape and the corresponding diameter of the vessels. A similar pattern is shown in figure 1. 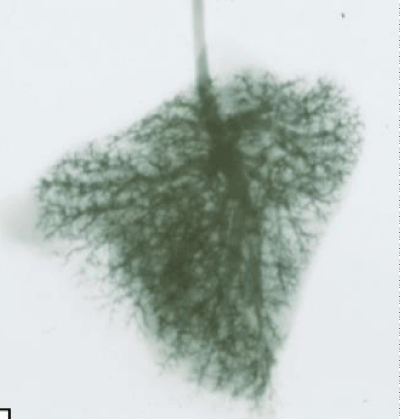 Figure 1: Arteriogram of the lung with extensive inflammation in the lower lobe. The distribution of contrast is uniform, and the diameter of the arteries is the same in all parts of the lung. Pathological results on arteriograms were found only at the stage of alteration. In such situations, there was a sharp depletion of vascular pattern or a complete absence of contrast vessels, depending on the spread and localization of necrosis. An example of such changes is shown in figure 2. Figure 2: Arteriogram of the lung with destruction lesions in the lower lobe. The contrast did not fill the peripheral vascular network in some areas of the lower lobe, which coincide with areas of necrosis. In contrast to the arteries of the small circle, the architectonics of the venous vessels of this system is exposed to visible changes already at the stage of inflammatory infiltration of pulmonary tissue. Already in this period of development of the inflammatory process in the affected area there is a significant decrease in the intensity of vascular pattern. It should be noted that this character of changes in vascular architectonics, which was also accompanied by a smaller penetration of contrast in the veins of large caliber, little depended on the severity of tissue damage in the АP zone. At the same time, in 2 cases with massive infiltration of the lobe of the lung, a contrast study revealed large vascular formations in non-inflammatory parts at the level of small venous branches. These formations in both cases were localized in the basal part and, from our point of view, were the evidence of excessive blood filling of healthy parts of lungs and opening of shunts (Figure 3). Figure 3: Venogram of the lung with total inflammation of the upper lobe. (Subsequent anatomical and histological studies revealed no necrotic changes). 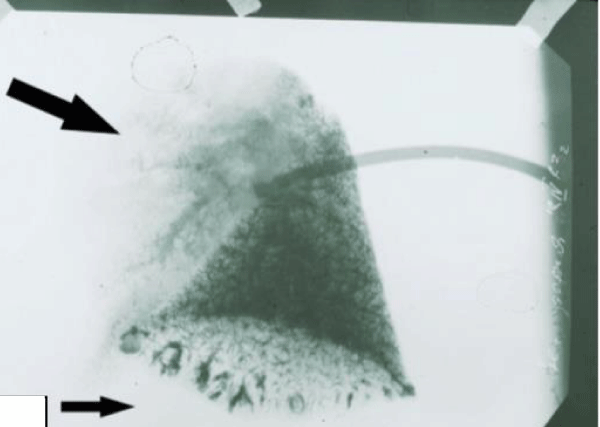 A sharp depletion of the venous pattern in the upper affected part of the lung(big arrow). In the lower part of the architectonics of the vessels is preserved, but against this background, relatively large vascular formations of semicircular shape are revealed(little arrow), which can be a reflection of overload and compensatory blood flow. Unfortunately, technical difficulties did not allow to conduct an identical study of bronchial vessels, the results of which could give a very important and interesting material for understanding the mechanisms of АP development. However, the results of studies that have been conducted, allow more detailed representation of the nature of vascular transformation in the focus of inflammation and in a small circle in the development of АP. The arterial sector of the small circle has a higher tone and blood pressure compared to the venous system. These qualities of arteries allow them to maintain their architectonics and provide the possibility of blood flow almost throughout the formation of the focus of АP. Only a complete blockade of blood flow in this area ends with the loss of a certain segment of blood vessels and irreversible consequences for the vassal tissue. The preserved delivery of blood to the zone of inflammation at the initial stages of the process occurs in the conditions of early appearance of difficulties with its outflow. The more malleable venous area is subjected to external compression as a result of progressive processes of edema and infiltration. If in the described situation to increase blood flow to the area of inflammation, in conditions of high permeability of the vascular wall and difficulties for blood outflow, such efforts will only stimulate tissue infiltration. The emerging restructuring of the angioarchitectonics creates a kind of «vascular trap». This phenomenon is one of the explanations of those clinical observations, when on the background of intravenous infusions in patients with initial stages of AP occurs catastrophically rapid deterioration of the x-ray picture . The described mechanism of stimulation of inflammatory changes in the lung tissue belongs to the affected area and has a local character. However, we should not forget that we are talking about changes in the blood flow in the pulmonary vascular system. It is known that this part of the circulatory system is responsible for maintaining the necessary proportions between the two circles of blood circulation. Such proportions are based on the equality of blood volumes that pass through each half of the heart, and the inverse ratio of blood pressure. Under optimal conditions, the blood pressure of a large circle of blood circulation is about 5-6 times higher than the same indicator of pulmonary blood flow, and Autonomous regulation is carried out through baroreceptors and is known to physiologists as the Schwiegk’s reflex [8,9]. The study of angioarchitectonics in АP indicates anatomical vascular changes in pulmonary blood flow. According to one of the postulates of biology and physiology, anatomical changes inevitably entail functional shifts, which in АP begin primarily with pathological reflexes. Elimination of reflex influence of АP-focus on systemic circulation is an important element of first aid to such patients [10-15]. A detailed description of all studies and clinical testing of new approaches in the treatment of АP can be found in the published monograph . Thus, the results of the study of angioarchitectonics in АP allow to understand and present in more detail the features of the mechanisms of development of the inflammatory process, as well as facilitate the preparation of a new doctrine of the disease.